I was ripped off in Madrid. I think the people are poor and do what they must to survive. Depending on the type of yarn she used, 25 dollars is not bad. Is that Yankk dollars or pesos? God old American Yankee dollars! Great comment, and absolutely right. Ronnie … Never make eye contact. Never wear or hold the goods. That’s how I got snookered into getting a kitten at the Farmer’s Market. Never make eye contact: that’s great advice. Thanks, Judy and enjoy that kitten. If you hadn’t bought it, you wouldn’t have this story to tell. Enjoy the trip! Right: so I got a $15.00 shawl and a $10.00 story. Sorry you for “taken” though I’m sure the woman still needed the money. Hope the trip was great. Lunch soon? Tourists are always marked as suckers. 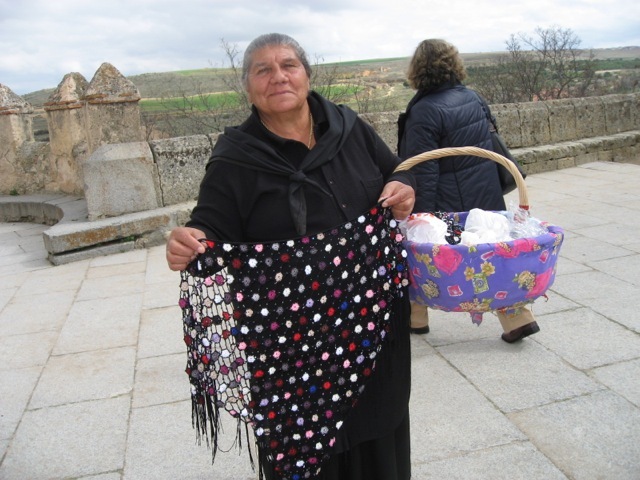 I remember bargaining for a beautiful hand crocheted tablecloth in Mexico. I got it VERY cheap. For years it adorned my Shabbat table and I felt guilty that I paid so little for it. Tourists can never win. Maybe it’s part of the travel experience. I don’t think you’re a sucker, Ronnie. I think you’re a kind-hearted person. And I am glad this happened, because it led to this post, which I found very helpful today. Many thanks to you (and the effective salesperson in the photo). Thanks, Ann, but I don’t understand how it helped you today. Was some slick salesperson trying to sell you the Brooklyn Bridge? I do like the Brooklyn Bridge, very much. Are you saying it’s for sale? Awesome! Oh, Ronnie, that incident is so sad and if you have not forgotten it, I am sure the old lady has not either. We have to live with our transgressions and I know she will remember all those she took as “suckers.” On the other hand, you may have done a great thing for her as she was obviously in need. You’re right, and I hope my naiveté will help her in some small way. So you don’t think she bought them wholesale? Buying retail and reselling is a tough way to work. You never know. Selling on the street is a tough way to make a living, no matter what price she paid for the goods. Maybe my purchase gave her confidence in her ability to sell. Oh my, a good deed for a cunning scheme. You poor thing. She probably still has mouths to feed, but it certainly leaves a bitter taste in the good-deed doer’s mouth! Not to mention all the garlic! So that’s what the bitter taste was; I thought someone out too much saffron in the paella.